Over the past several years, antique paper collecting, especially movie posters, has become one of the most lucrative investment opportunities to be a part of. However, for most of us who collect simply because we love movies, the fact that our poster collections have increased in value is an added bonus! Displaying our movie poster collections, lithographs, serigraphs and any valuable or irreplaceable paper can be costly and if not done properly, may cause deterioration over time. Much information has been disseminated on how best to frame collectible paper; some beneficial and accurate but much erroneous. To be fair to many retail frame shops, while most are very knowledgeable, some are inexperienced in framing collectibles while others sell components that are truly unnecessary. Many times it may be suggested that by adding certain components to a frame job one will preserve and even increase the value of their collectible. Remember while there is generally some truth to these suggestions, pieces do not need to be “framed in gold” to preserve their archival integrity. Often these suggestions are made solely to increase the price tag of an order while taking advantage of the customer’s lack of knowledge and their desire to preserve their items. We receive phone calls, emails and letters daily from customers all over the country saying that they were told they “had to do this” or by not following the framing establishments’ suggestions the store owner would not be held responsible for any poster deterioration regarding the frame job. Well this is enough to make any serious collector submit to consumer blackmail, since for most of us, our poster collection is one of the most important things we own and treasure. So in an attempt to clear up some misconceptions and hopefully educate the collector, we offer some invaluable tips on framing. First of all, the actual frame you choose has little, if any, impact on the preservation of the poster. The frame for the most part is purely aesthetic; this is assuming that you are choosing custom quality materials specifically designed for picture framing. If someone tears the side of a barn off and makes a frame for you, it may look great but it might also have some friendly little termites living in it. The most important components of the frame job is what’s in front of your piece and what is behind your piece. Let’s begin with what’s in front. We suggest not using glass. Firstly, it can break, and if this happens, often your item is scratched, torn or ruined. Glass is also a heat conductor and accelerates fading and decay. Glass has other negative aspects as well, including the possibility of moisture entrapment. Framers often recommend spacers, but then do not dissuade customers from using glass. Even if spacers are used, movie posters are so large that they often touch the glass near the center, thus defeating its original purpose, and can actually warp into the space the spacer has created. Framers often recommend conservation glass that has UV filtering, but note, it is still a heat conductor that accelerates yellowing and brittlization. The issue of moisture entrapment still exists and there is also still a possibility of breakage, especially with larger sizes. Glass, of any kind, is extremely heavy for any oversize pieces. Conservation glass is also extremely expensive since it is very much a specialty product. When glass breaks it can shatter or just have a clean break in half. Either way, the likelihood to sustain moderate to severe damage to your poster is high. Often times when such a large piece of glass breaks, the top half of the glass will slide behind the bottom half and scrape the face of the poster making it extremely difficult to repair. 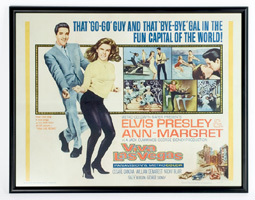 Thus, plexiglass is the recommended covering for your movie posters and valuable paper. We have had customers say they don’t like the look of plexiglass: it scratches, turns yellow, gets an opaque film over time. This is not high grade plexiglass! Just as some people call all tissues, Kleenex, many people call all plastics, plexiglass, while it is not. There is Lucite, styrene, low grade acrylics and many other forms of plastic sheeting, most of which have no archival qualities and least of all have no UV filtering. UV filtering is one of the most important components to plexiglass for movie poster and paper preservation purposes. Plexiglass also does not absorb dirt and grime from the air since typically it has been polished with an antistatic cream before it is installed in the frame. Actually, when polished, plexiglass will repel dirt and dust and very rarely even needs cleaning or repolishing. Just an added note, if you currently have something framed in your home in plexiglass or any form of plastic, never use any ammonia based cleaner on it as the chemical reaction with the plastic is what causes clouding. Another complaint we hear is that plexigalss warps and gives the poster a distorted look. Again, this is typical of the lower grades of plastics that are very thin and don’t lie flat in the frame. A good piece of plexiglass should be the same thickness as glass, about one eighth of an inch thick. A huge difference between glass and plexiglass that definitely is not crucial to the preservation of the poster but important to mention is that glass has a green tint to it and a good grade of plexiglass is crystal clear. Lower grades of plastics have been made with inferior materials. Remember, the most important element of framing anything you want to preserve, is that it be framed in an acid-free environment. Plexiglass with extremely high levels of UV protection, say 98% or 99%, in our experience, often have a yellow tint to it. This type of plexiglass would be used on extremely valuable items and perhaps items that are hung near high exposure areas. We, at Hollywood Poster Frames, do offer OP-3 P-99, which is 99% UV filtered and non glare, as an option to your frame order. There is a cost upgrade and you would contact us directly to place that order. Plexiglass is available in clear and non-glare. For many years we have seen customers who prefer a non-glare covering for their artwork. While non-glare glass is readily available there are inherent problems with this product. By nature of its design, when non-glare glass is placed over the artwork, it has a tendency to dissipate color and take the art slightly out of focus. This is especially true if you are using a mat over your artwork as this creates even more depth between the artwork and covering. Most importantly however, it is glass, and still has ALL THE NEGATIVE ASPECTS OF GLASS. Several years ago, non-glare plexiglass became available which is as near true-view perfect as you can get, while still maintaining the high quality of UV. We immediately switched all posters that hung in highly lit areas to this non-glare plexiglass product and have been thrilled with the look ever since. Whichever type of plexiglass you choose, clear or non-glare, as long as you select high quality material with UV filtering, you will be helping to preserve the integrity of your own collectibles. The last component and probably the most important is what you have backing your piece. Whether your poster is linenbacked or not, still it is important to never put a non acid-free product behind your poster. Paper is very absorbent and will absorb the acid out of cardboard or the like very quickly. This will age your poster very quickly and leave you with a yellowed and brittle poster. Many people believe that foam core is the best product to use for backing valuable items; this could not be further from the truth. Regular foam core, which is what most people use, is not acid-free. One cannot assume because it is white in color it must be acid-free. On multiple occasions we have had customers bring very valuable posters and artwork to us that have been previously framed elsewhere. While all the time these customers believed they had a museum quality frame job with a high price tag, once in front of them and removing the foam core from behind their piece they witness the foam core disintegrating in our hands and yellowing the back of their art. Remember, most movie posters and collectable paper are not acid-free. In order to stop them from yellowing and disintegrating away, they must be housed in an acid-free environment. There are several companies that make an acid-free foam core or art board. One of the best is the ArtCare Archival System by Neilsen Bainbridge. ArtCare is the only foam board that actively protects artwork from the ravages of pollution, paper degradation and the by products of the artwork’s own aging. It traps and actually neutralizes harmful pollutants that cause fading, discoloration and damage. Whether you’re framing a piece worth $100 or $100,000, this product will preserve its condition from the day it is put in the frame. The amazing thing is, this acid free foam board only costs little more than the plain non acid free foam core but many framers cut corners and assume the customer will never know. The most important message we hope you have taken from this article is that it does not have to cost an arm and a leg to frame your movie posters and collectibles! Hopefully now you possess some necessary information that will help you feel confident to display your items in an archival way so that you may enjoy them for years to come. Can I trim off the excess linen from my poster before I frame it? When should I linenback or paperback a poster? This is another one of those questions that only you can make the decision on. There are reasons that we linenback, paperback or gelback posters and artwork. Linenbacking is usually done because some sort of restoration is necessary. Generally when a poster is linenbacked, the restorer also cleans and deacidifies it….